Everything went sideways in a very good way today! I didn't think we would roll it over so early, but we had a couple of sizable donations that helped us meet our match fast! And then we tossed in Cynthia's match money and her $5k bonus and all of a sudden we're at $108 squillion and some change! What a remarkable afternoon! I'm so thrilled we've passed our goal, AND we've raised $15K for the community cats! Great job, everyone. AND I MEAN EVERYONE -- we rolled past 100K because of all of you. 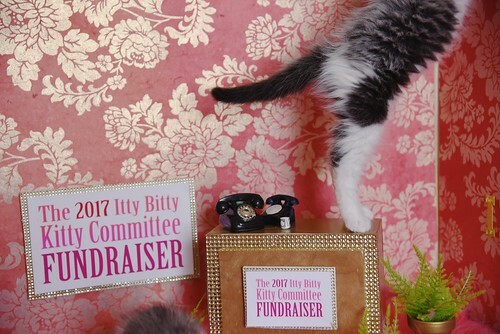 If you donated, shared a link, offered a match, gave us a high-five, left a nice comment, purchased a print, bought an auction item, donated an auction item, named a kitten, or "liked" a post, YOU contributed to our victory! Thank you for all of the love and support. It's getting too late to start the couple of auctions I have left, so I'll wait until tomorrow to kick those off. I always like to consider all time zones with the auctions and want them to end at a time that's not too late or not too early for anyone! I'll be back bright and early tomorrow! I have so many things I want to share. And more thank yous, of course. And maybe we'll try to bring in a couple of more dollars. Just a couple -- only because we have a couple of days. Don't worry, we won't be pushing hard. We'll see you tomorrow! I'm going to go cook a proper dinner, pack a few more prints up, and snuggle with some cats and kittens. Goodnight, dear ones. Sleep well.